Unlock your perfect villa holiday in the contemporary Villa Ruya. Combining true luxury, clean contemporary design, space in abundance. Unlock your perfect villa holiday in the contemporary Villa Ruya. 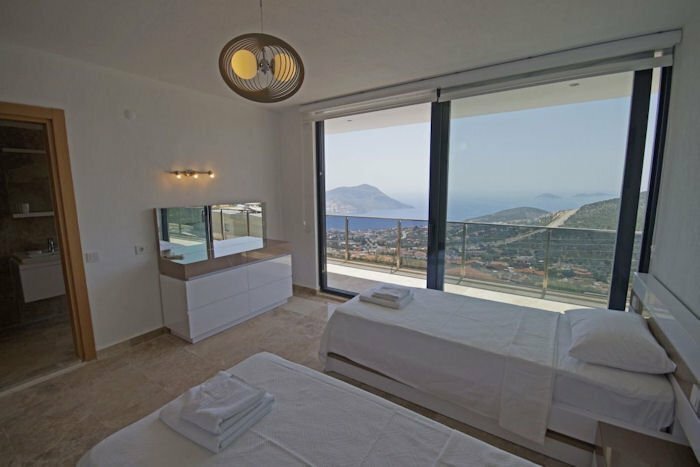 Combining true luxury, clean contemporary design, space in abundance, and what has to be one of the most spectacular views in Kalkan, then this is the villa holiday for you! Villa Ruya is a dream House with a fabulous infinity pool offering stunning views over the bay of Kalkan. It's a brand new luxury villa in Kalkan built in a very contemporary style offering you true luxury inside and outside. It's been designed to take advantage of the incredible sea-views with all the principal rooms and bedrooms having magnificent views. The sitting room leads out to the pool terrace furnished with sun beds and shaded by a striking blue sail. The gardens have been beautifully landscaped however the highlight is without doubt the infinity pool with its stunning views. This is a great area for fun and relaxation with a luxury outdoor seating area and dining table for twelve people where you can have a sundowner or two! There are local shops within a short walk including a green grocers plus just a few minutes by car to the resort centre of Kalkan.